With more states continuing to legalize the use of medical marijuana, dispensaries are becoming more and more competitive. Not only do you need to deliver a quality product but you must also provide an environment that is appealing to your customer. You don’t want your facility to appear unkept or unsanitary, that’s why you should consider commercial floor coatings for your marijuana dispensary. Concrete floors are prone to becoming stained, cracked, or slippery—this is not only unattractive aesthetically but also could be dangerous to your staff and customers. You want to be sure that you are protecting your customers, employees, and yourself from any potential injury or liability. Be sure to hire Prestige Floor Coatings in order to have a safe, good-looking, custom floor coating in your medical marijuana dispensary. Aside from the aesthetic benefit to coating your floor, there are numerous additional benefits to using a floor coating on the concrete floor of your marijuana dispensary. We have been contracted for manufacturing facilities and dispensaries so we know what is needed and how to properly apply a coating for this type of application. We want to make sure that you know that you are working with an excellent team who prioritizes high-quality workmanship and stands by the products that we use. Our floor coating options are a smart and safe option for your medical marijuana dispensary and we are certain that our product will not impact the health of your plants. When freshly installed, our floor coatings do not emit any odors and are eco-friendly from the beginning manufacturing process to installation. One of the best parts of deciding to coat the flooring of your marijuana dispensary is that you have the opportunity to customize it and make it exactly what you want it to be. Prestige takes custom design very seriously and we offer more than 500 color and design options, many of which are chemical resistant, UV protected, and scratch resistant. We are hands on and you work with us in looking through the color samples and deciding on which option is right for your business. Didn’t find the exact look you were going for? Not a problem, we can create a custom chip blend for you with the assistance of one of our trained design consultants. After designing your custom commercial floor coating you will be sure to have an attractive and professional environment for your customers. 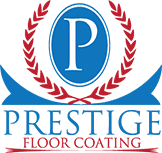 If you are designing your medical marijuana dispensary and are in need of a quality floor coating be sure to reach out to us at Prestige Floor Coating. We will be sure that your floors are installed in a timely manner and on budget. Call us at 443-519-2628 or request a free estimate online for your marijuana dispensary floor coating.